Soon afterward, two pirates moved to one of the hatches of the lifeboat and stuck their heads out. The third pirate advanced toward the captain and pointed his AK-47 straight at Phillips's back, the rifle touching it or inches away, the official said. You know, the only way to describe this turn of events is..........poetic. To have the USS Bainbridge responding to an incidence of piracy is simply poetic. The ship's namesake, Commodore William Bainbridge, one of the early heroes of the US Navy, at one point was taken prisoner with his entire crew by Barbary Pirates. Aubrey-Maturin fans will remember him for another reason. Bainbridge’s greatest achievement was his victory over HMS JAVA on December 29, 1812, off the coast of Brazil while captain of USS CONSTITUTION. Old Ironsides, the ship’s enduring nickname, is the oldest commissioned U.S. Navy warship. Berthed in Boston, Old Ironsides continues to carry a replica of HMS JAVA’s wheel, which was removed from the hulk following the battle and used as a replacement to Constitution’s own destroyed wheel. 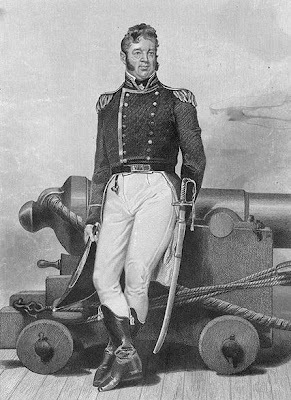 During the battle, Bainbridge led his sailors to victory despite being twice wounded. Excerpts of his logbook account of that battle may be read here.